Needle snails are small to tiny terrestrial snail with a cylindrical, bluntly tipped shell. Needle snails live deeply under the leaf litter and under fallen logs. Needle snails, in spite of their small size of less than 5 mm, are carnivores, they feed on other snails' eggs. Needle snails are not terrestrial pulmonate snails, they are the third native group of terrestrial snails with a shell lid (operculum) and only two tentacles, like round mouthed snails (Pomatiidae) and Cochlostomas (Cochlostomatidae). Their nearest relatives probably are the likewise terrestrial Cochlostomas, but science is not sure about the systematic position of the Aciculidae. Many needle snail species have a very disperse distribution pattern; some of them have been existing as Tertiary relics with little change since the Miocene. Boeters, H. D.; Gittenberger, E.; Subai, P. (1989): Die Aciculidae (Mollusca: Gastropoda Prosobranchia). Zoologische Verhandelingen 252 (1), 1 - 230 (Link). Systematics of Gastropoda: Clade Caenogastropoda: Aciculidae. Switzerland. Picture: © Stefan Haller (schneckenfoto.ch). Acicula lineata sublineata, from Lombardy, Italy. Picture: © Gianbattista Nardi (Source). 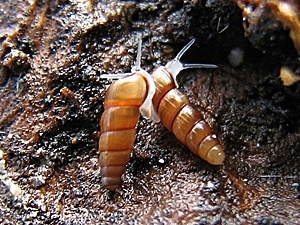 Description: The smooth needle snail's shell is reddish brown and smooth. The whorls' outline is almost straight, the shell tip (apex) is blunt and rounded. The last whorl slightly ascends before the aperture. The aperture rim is slightly thickened inside. On the outer side of the aperture's rear wall (the shell's "neck") there is a significant bulge, which in Platyla polita is clearly limited to the front and to the back. Dimensions: H: 2.4 - 3.85 mm; W: 1.05 - 1.35 mm. (Abbreviations). 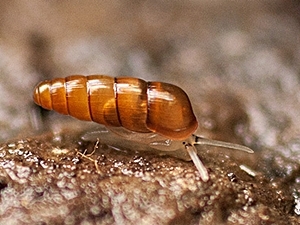 Habitat and Distribution: The smooth needle snail lives in moderately humid forests in the leaf litter, under fallen logs and stones. In generally, live specimens are not found, but from earth samples, the shells can be sieved. The distribution area of this species stretches from Denmark to the Alps and Rumania, with disperse populations from Spain to Bulgaria and St. Petersburg, as well as North Africa. Threat Situation: In Vorarlberg the species is endangered (EN), in Spain and Germany it is vulnerable, in Switzerland it has been classified as near threatened ( IUCN Threat Categories). Francisco Welter-Schultes: Platyla polita species homepage. Description: The striped needle snail has got a reddish brown shell, striated irregularly but distinctly (there are 20 to 30 striae on the penultimate whorl). The weakly rounded whorls often display an edge below the suture. The last whorl ascends before the shell mouth (aperture). At the aperture's lower side, the palatal callus is clearly limited, the apertural rim is not very broad. The bulge at the shell's "neck" is present and may differ slightly in colour from the remainder of the shell. Dimensions: H: 2.8 - 3.7 mm; W: 1.0 - 1.3 mm; N: 4 - 6½. (Abbreviations). Habitat and Distribution: The striped needle snail lives in the ground litter of open forests, as well as in rock rubble. The species can be found in the Northern and Western Alps, as well as in their promontories; in the Southern Alps it is distributed between the Lago di Garda and the Lago Maggiore. In Switzerland, the species is found in altitudes up to 1800 m MSL. Remark: Two subspecies are distinguished - A. l. lineata (Draparnaud 1805) in the northern part of the distribution area, and A. l. sublineata (Andreae 1883) in Italy and Southern Switzerland. Threat Situation: The striped needle snail is classified as endangered in Germany, in Switzerland as vulnerable ( IUCN Threat Categories). Francisco Welter-Schultes: Acicula lineata species homepage.